We are Leading Supplier and Trader of Professional Sound Equipment,Professional PA Speakers,DJ Equipment,Stage & DJ Light and Speakers. We are only Prefer Local inquires from Anand,Nadiad,Mehsana,Himmatnagar,Modasa,Visnagar,Dahod,Rajkot,Jamnagar,Palanpur,Vadodara and all cities from Gujarat with Special Discounted Prices. Hitune Bass Conference system provides the much required sound reinforcement at meetings while eliminating problems of poor acoustic feedback. The system is versatile and easy to install. System suitable for all types of seating arrangements. Hitune Bass Conference system offers perfect communication among the participants and helps to maintain the authority over proceedings. State-of-the-art design, low profile compact units. Stylish slim-line gooseneck microphone with illuminated LED ring. Click-free switching during mic ON/OFF. In-built limiter circuit in each unit provides uniform sound output. Priority switch on Chairman unit enables Chairman to over ride all the delegates. Conference Systems available in desk top and fiush-mount versions. Single conference controller can support upto 50 units and the system can be expanded with additional controllers. 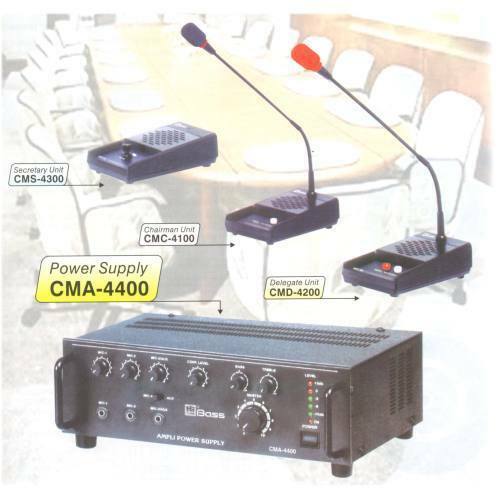 Controller has a built in 50 watt (rms)output amplifier connecting wall or ceiling mounted speakers for additional sound re-inforcement. Controller provides 3 mics /1 Aux input and two outputs for recording purpose. Different colour combinations and length of mics can be provided on request. We are looking for local queries from Ahmedabad. With in-depth domain expertise, we are capable of manufacturing, trading, supplying, distributing and retailing superior quality products like Karaoke Systems,D.J. Systems,Public Address Systems,P.A.Systems,Ceiling Speakers,Wall Speakers,professional Sound Systems,installation Audio Systems and Professional Amplifiers. Backed by an advanced infrastructure, we are capable of manufacturing nothing except superior quality products. To maintain the quality of our products as per international standards, we procure the material to be used in manufacturing process from reputed vendors like Boss, Pro Audio, Dainty, JBL Professional, Sennheiser and Ahuja. Also, we test the entire range of finished products on well-defined parameters like accuracy, performance and power consumption. Along with customized packaging, we also ensure that the consignments are delivered to clients in a lead time of 1-7 days. We are looking for local Inquiries from Gujarat,Rajasthan,Madhya Pradesh And Maharashtra.